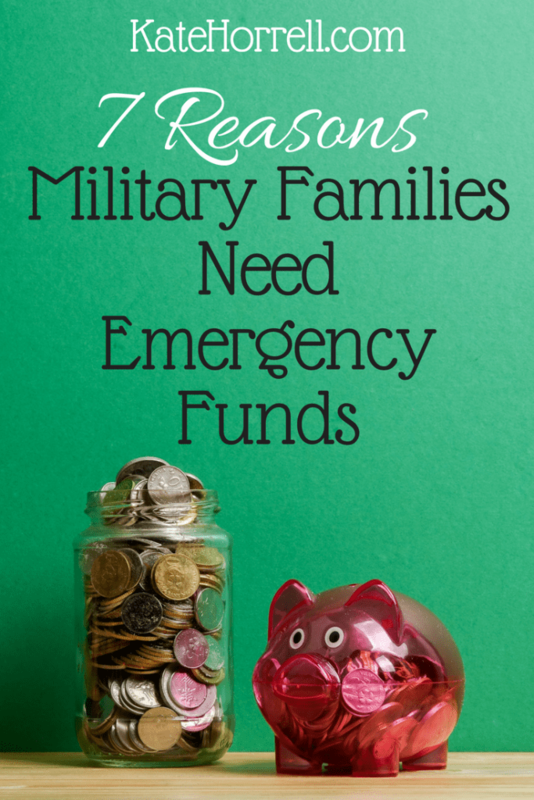 Once upon a time, I used to think that our family didn’t need a big emergency fund because my husband is in the military. Payday comes twice a month, and the possibilities of him getting kicked out in a short amount of time are small, right? As I’ve gotten older, I’ve come to realize just how wrong I was. Yes, payday does come twice a month, and most people who leave the military unexpectedly still have at least a few months notice. But those two facts don’t mean that military families don’t need emergency funds. In fact, I now think that military families have even more reason to build up those larger emergency funds. For purposes of this conversation, let’s define a “big” emergency fund. A common guideline is 3-6 month’s of expenses, but the exact individual amount will depend on your specific situation. Me, I like 1 year of expenses. I know it is a lot, but I gotta sleep at night, and I don’t need one more worry keeping me up. Your “big” emergency fund will depend on a bunch of different factors: where you’re stationed, whether you’re married, other sources of income, kids, do you have debt, owning a house, do you have a non-working spouse who could go to work, special needs, etc. Only you can figure out what you need, but I’d encourage you to err on the high side. As my friend Rob says, “You haven’t seen your last military pay problem.” He’s right – military pay gets messed up a lot. There are so many moving parts, and things that can go wrong, I sometimes wonder how military pay is every right. A solid emergency fund makes a pay problem just inconvenient, not a disaster. I have another friend whose husband didn’t get paid for months after an overseas PCS move, and she’ll attest that their emergency fund was key to getting by. As long as we’re talking about PCS moves, let’s talk about the financial upheaval they can cause. During one big PCS move, at one point, the Navy owed us over $10,000 for travel expenses, Dislocation Allowance, and Temporary Lodging Allowance. Yes, we got that money eventually, but I was a lot more comfortable not having that sitting on my credit card and wondering when the paperwork was finally going to get processed. Goodness knows travel claims have not been fast lately. While the military allowance system is pretty generous, and typically covers most expenses, there are definitely times when it doesn’t cover everything. Moving pets overseas can be costly, especially if you add quarantine or boarding costs to travel expenses. A new rental may require a hefty security deposit plus first (and last) month’s rent up-front, and you may not have the security deposit back from your last place. Sometimes a move requires that you buy and/or sell cars, or throw down a ton of money for school uniforms, or some other random expense. And then there is the issue of moving when you’ve bought a house. It is expensive to own a house and move away from it. If you want to sell, you’ll need cash to prepare the house to sell, plus possibly carry the cost of the home while it is on the market. Heck, sometimes you’ll even need to bring cash to the closing in order to sell. If you’ll be renting your home, you will need to prep it to rent, possibly carry the cost of an empty house, and set up a hefty emergency fund for the landlording emergencies that are bound to happen. Government shutdowns happen, and yes, it is possible that military pay can be held up by a government shutdown. We all hope for the best, but it is better to prepare for the worst possible situation. While it is awesome that we’ve had bills to ensure that the military has been paid in past shutdowns, they aren’t guaranteed in the future. Same goes for the generous “we’ll loan you your paycheck” programs offered by banks and credit unions – they’re a great help, but not guaranteed and probably won’t be offered if more than one paycheck is delayed. The longer we’ve been around the military, the more I realize that there are many, many exceptions to that whole “no surprise separations” idea. Whether it is an early retirement offer, a DUI conviction, a family emergency, or a medboard, I’ve seen service members go from “doing 20” to “out” in just a couple of months. Surprise separations are stressful enough. You don’t want to spend those weeks scrambling to figure out how to create some savings to get you through. Even “lifers” don’t actually stay in the military forever. Everyone will separate or retire eventually, and will want some savings to help with the transition. In my mind, it makes sense to have that transition fund set up from day one. A single new recruit might need just $500 or $1000 for their emergency fund. As their life changes, it is relatively easy to increase that fund by $1000 at a time to reflect increasing needs as the service member adds responsibilities and family members. It’s a heck of a lot easier to do that one step at a time than to figure out how to save $50,000 when you’re separating in two years. Might as well build up that fund now. Leaving the military can be very different than a job change for a civilians. While some military families stay in the same place after retirement or separation, most make (at least) one more major move. The military will pay for that, with some limitations, but there are still expenses. Many of the cost-saving benefits (like dislocation allowance) and protections (such as being able to maintain your state of legal residence elsewhere) no longer apply once you’ve left the service. Many veterans are surprised at how long it takes them to get a job. More surprising? The average veteran changes jobs at least once within the first two years after leaving the military. We all know the guy who left work in uniform on Friday and returned in civilian clothes on Monday, right? Well, that may happen, but it is not nearly as common as the urban legends would like you to believe. I regularly hear of folks who take six, eight, eighteen months to find a job. Obviously, every person needs or wants a different amount of emergency fund. But please, please, don’t think that you don’t need to have a big emergency fund because you’re in the military. There are so many reasons why that’s not true!